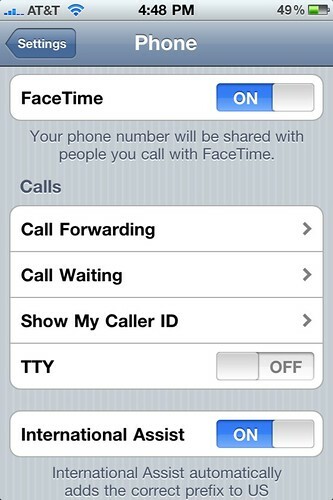 I discovered today that FaceTime didn’t work on my iPhone 4: people couldn’t start FaceTime calls with me and I didn’t have any of the FaceTime buttons present. Turns out that this problem is caused when restoring from an iPhone 3G running iOS 4 — it seems the FaceTime on/off setting is imported from the iPhone 3G (which has it turned off as it doesn’t support FaceTime). Going into Settings > Phone and then flipping FaceTime on solved it for me. Other people seem to have had to jump through a couple of extra hoops to get this to work, if flipping the switch didn’t get you going, take a look at this post over at the Rusty Brick blog. Update 2010-08-22: Still having trouble? Did you jailbreak your iPhone 4? There’s something else that might stop this working too. Update 2011-02-22: Did you find this post helpful? Want to do something in return? Please consider transferring your web hosting and domains to File Sanctuary, my hosting company, we’re probably cheaper than your current hosting company, and we do everything we can to look after our customers!